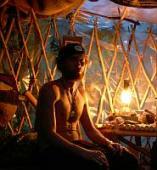 Anyone who travel with its own dwelling, belongings and does not become settled at one particular place for longer than a duration of a warm or cold season at that location, utilizing the advances of technology but choosing low-tech solutions for existence, thus participating in new nomadic life. "To turn to the future is not at all easy. It sounds simple - to leave the past and look to the future. It is both simple and beautiful, but how shall we light the bonfires of the past and where shall we find the fires to illumine the future? The attainment of the spirit will prompt how to find these boundaries and measures. But how to squeeze the heroic deed into everyday life? Fortunately every heart is a ready purse for achievement. In all times the population has been divided into settlers and nomads. The nomads moved by the power of search for achievement, they had no place of their own. But for the future they found the strength of achievement. Such striving of the heart is inherent in every human life. Amidst the precipitants resulting from heroic achievements must be found this noble restlessness, leading into the future. Only thus may one escape the snares of the past". 2Fiery World II, 42. Being a nomad is a great way to learn. So all of us are Cosmic Nomads. Being a nomad here, on Earth, is very natural. Ghengis Khan was the greatest nomad the world has ever seen - his preferred dwelling was ger, known also as a yurt. Ghengis Khan was one of many rulers who managed no only to unite a fractured people, but lead them on a conquest of the world. 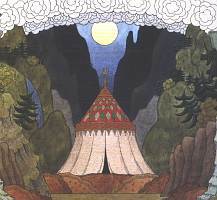 Most Mongolians really do live in yurts, known locally as gers. In Mongolia even around the capital city there are yurt suburbs. Where would nomads live these days? Anywhere, really. However, out of the city is nomad's best bet. Anywhere where you can set up your nomadic dwelling and grow, forage or barter for food and where there is access to clean water, fresh air and natural resources you need to sustain your existence. There are people who do it on a regular basis , though they live most of the time in cities. Rainbow Family of Living Light is one of them. Anything you can call home and which employs traditional design, is transportable, lightweight, relatively cheap and has a low maintenance cost. Nomad's home is where nomad is. There are several traditional designs, from around the world, which cost very little in resources and efforts to build and maintain. How about a home under $200 ? Of course, amenities are extra. In the land of deep lakes and great boreal forests of north eastern Ontario , Canada, in Temagami, which means "deep water" ( Te-mee-aygaming ) in local Native dialect. 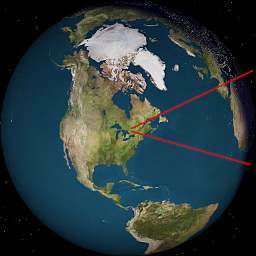 Twice a year I travel to the city of Toronto, which is 500 km south, to visit friends and enjoy high-speed Internet. In a cosmic sense, my home is where I am. Do you need a permission to live there? 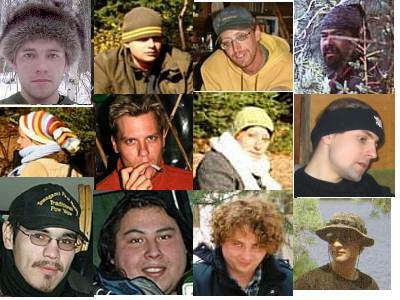 People from Bear island Indian Reserve, whose traditional territory around lake Temagami is 4000 square miles and still is under negotiations with the governments of Ontario and Canada, and who know me personally, do not have anything against me living in their Land. Many are my friends and it is great to learn from them. Canoe is the best way to travel in the Land! 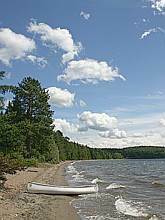 All lakes are connected through ancient network of trails (portages), known as nastawgan which are being used for millenia by Native people. These days Ontario Parks rangers start to maintain certain portages, charging fees in the Park area, but Teme-Augama Anishnabai (Native people of Temagami) never charged anyone and many of them do not welcome such commercialization of their traditional travelling routes. There are old and new logging roads, which can be dangerous to use while logging trucks use them - in winter 2003 I almost got hit two times by a logging truck on Red Squirrel Road which was driving way faster than posted speed limit of 50 km/h. 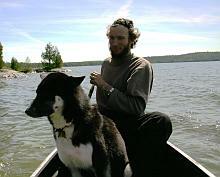 Nimush the dog always sits in a bow of a canoe and thus helps in paddling against high winds. Sometimes he runs along the shore, swimming across bays and inlets. Growing certain food ( potatoes, squashes, beans, radishes, turnips, leafy greens) is very rewarding. Many do well even during cold summers (like that of 2004). It is not easy to find good soilsince it is rock or sand or clay. There are few places at the mouth of rivers where ancient sediments allow many vegetables to grow. There are about several varieties of berries which grow around - blueberries, raspberries, wild strawberries, saskatoon, rosehips (wild rose), soapberries, wintergreen berries, mountain ash, highbush cranberry, wild cherry, wild red currants, wild grape. Not everywhere but at certain places quite a few wild edible mushrooms grow from July to September - about a dozen of species which could be dried in the sun and used for soups. Small hazelnuts are all over but squirrels are really quick to pick them up! Also I can buy some non-local food, such as peanuts and raisins, if there are monetary resources :). As for a long-term, there are foods which are lightweight, can be stored for months and yet are tasty and very nutritional. More info on nomadic food is being prepared. How do you cook food? On open fire. All year around. Fire is very important and not only in cooking food, and being so close to the fire the food receives its power too. You know that Fire lives in the hearts of those who love the future. Dry poplar sticks is the best firewood for cooking fires - so little smoke and catches fire quickly and leaves nice coals. Any gas stove or camping fuel stove would be all right as well, as soon as you can refill it somewhere. What about water for drinking, bathing, washing clothes etc? Lake Temagami and area is blessed with many lakes where water is clear, in spite of acidic fall-outs from nickel smelters located in the town of Sudbury, about 40 miles away. Just boil water before drinking, in winter it is not that important, since water is cold and still under the ice. 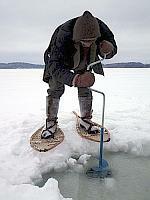 In winter to get water water hole needs to be cut in the ice, with an auger or an axe. If it is covered and used daily, it takes a month for the ice to grow over the hole. 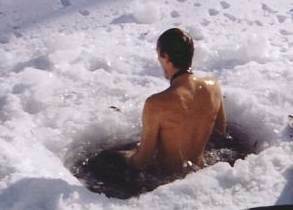 Swimming is daily from spring to fall, in winter it is all right and very good for health to jump into a +4C water. It is not difficult to build a sweat lodge according to a traditional design. Clothes are being washed in a bucket with some water heated on a fire and then hang out on the sun and wind to dry up. Some flat rocks on the shore work as a washing board. 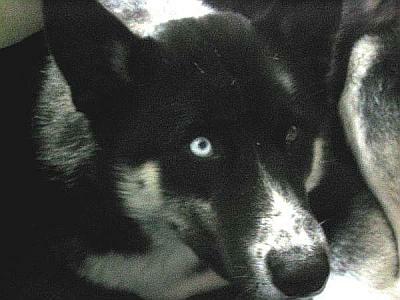 For a husky dog which is my companion I need to hunt squirrels with a BB gun, but he himself can catch a beaver, a mouse, a snowshoe hare, a racoon and a squirrel. Well, I wear moccasins made from deer and moose hide and may eat some smoked meat once in a while. 'vegetarianism' is just another limiting label, how about more wider notion, such as 'compassion'? What about source of heat in cold season? This comes from firewood. The best is dry, really dry birch, but even better is dry, naturally seasoned ash. Dry poplar is good for cooking fires, since it produces very little smoke and it is not that irritant to your eyes. A woodstove works great even at nights of -38C! 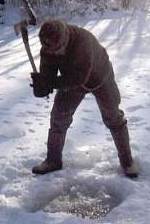 Usually, every 3 or 4 days in winter I need to spend few hours cutting, haling, splitting dry firewood. To haul logs i use simple plactic sled. Firewood makes you warm twice - when you split it and when you burn it! It is good idea to have a little stash of dry poplar for one of these chilly +5C nights in July or August. There are many natural remedies ( herbs, trees, berries) in the bush. Also, sunshine and cold water helps to restore balance in the body and mind. But I only get flu-ish kind of sickness when travelling to big cities - North Bay or Toronto. These places are infested with all kinds of germs, viruses, ads and spyware. Bush is pure and clean. Everyday activities keep body in a good shape. Clean air and clean water without fluoride are essential too. In case of any sickness or low motivation, stamina or fatigue and to increase vital force it is great to sleep on the roots of a pine or a cedar. Air in a pine forest is sterile - no viruses survive - and is filled with energetic emanations (prana) - the wealth of life. Are there other people around there? Yes, my closest neighbour is about one mile (1.5 km) away and then another one is about 5 miles (7km) to south on the island of lake Temagami. Both of them live there year around and we visit each other once in a while. The town of Temagami, about 2000 permanent residents, is about 50km travel on the lake or almost the same distance via Red Squirrel logging road and then a highway. The closet city of 55,000 people is North Bay, about 140km as crow flies to the south - at nights the light pollution is visible on the horizon from the south ( North Bay) and south-west (Sudbury, about 70 km as crow flies ). Yes, friends come often, all year around. What do you do all day there? To say it simply, I am never bored. 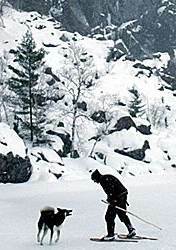 :) There are daily chores to do, and there are things to learn, and , of course, there is time always to swim, paddle, hike ,ski, play with Nimush the dog and talk to visitors. There are many books I can enjoy reading and crafts to do ( making didjeridoo-s, crossbow etc ), practice target shooting. Always thinking on improving the design of a shelter, looking for dry firewood, watching clouds, lightning during thunderstorms, picking berries, cooking food and working in a garden. Hanging out with friends, who come to visit quite often all year around. No, I do not have electricity but considering generating it with the help of wind or running water. For a general light kerosene lamp or a candle works just fine. And LED headlamp is the best for many activities, even skiing or paddling at night. I use rechargable batteries and a solar charger for any kind of baterries. How to become free in spirit and attain self-realization. And how to tell others so they can understand. There is no fear once the goal is realized. Some may consider this to be a racist question. But I had so many names and been through so many bodies, how can be such question answered? I remember well this time here though. "Am I mad? Yes, like all the civilization on this planet. I think all humanity now is absolutely crazy." - Alejandro Hodorowsky. visitors since spring of 2005!